Double your productivity without spending too much with the OKI 44574901 Toner Cartridge. This toner cartridge provides outstanding, clear, and crisp results. Plus, it can yield up to 10,000 quality pages, making it ideal for growing businesses. 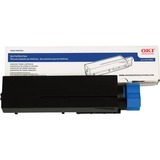 Get the best-value for your money; purchase the OKI 44574901 Toner Cartridge today!